A safe, simple and convenient device that prevents accidental operation of wall switches. This miniature box with a flip-top lid attaches directly over the switch, permanently solving the age-old problem of unwanted switching. Perfect for furnaces, computers, TVs, VCRs, clocks, etc. Constructed of durable polypropylene. Made in the USA. I bought these because we have small grandchildren. The little ones figure out what every switch is for, including the one for the garbage disposal. The switch was installed on the front of the cabinets where it was convenient for my grandparents when they built the house. After installing this cover, it is almost like they don't even remember there was a switch there. Eventually they will figure out the cover, but for now, we're good. Thank you for the review, Mark! By the time they figure out the switch is still there they will know not to touch it. Thanks again! Does exactly what I needed it for. 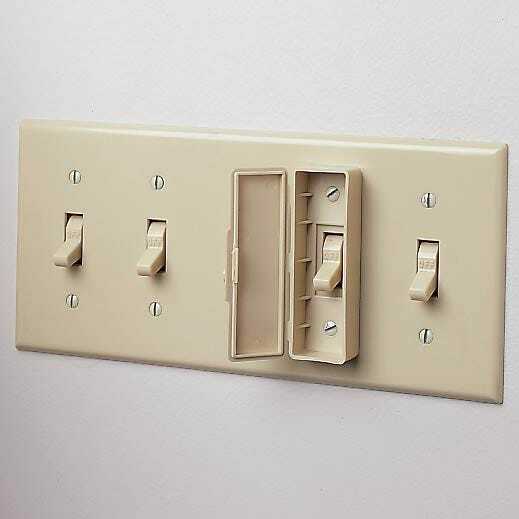 kids can no longer turn off a switch that is intended to left on. I bought these years ago and have been very happy with them. I have used them for various purposes such as making sure that nobody would turn off my router or TV to making sure my little ones can't operate certain switches. I just recommended them to a friend who was complaining about switched outlets. Inevitably, there is a switch one wants to close off/protect. This device has been a mainstay in our properties for years. It is not easily opened by a small child proof, yet not difficult for adults. It comes in the “bone” color akin to nominal switch plates. You can't go wrong on the product. The shipping is expensive, so make your choice intelligently. We have a disposal switch in a rather odd place that gets turned on by guests and now it's no longer a safety problem. Love this small but simple switch cover. I have Smarthome Insteon remote control and several of my switches are two.three way. only one can be used so I cover the others to prevent accidental usage. ONE SMALL WORD OF ADVICE. Only push in the top of the cover!!! This will then open up the cover easily. I have driveway and porch lights that are switched in the house. They are also controlled by photo cells built into the fixtures. The switch keeps getting flipped off, then the lights don't come on when they should. This handy switch cover now makes flipping the switch an "on purpose event." switch cover is right on, fits very well. Simple solution, glad I found it. On/Off switch above kitchen counter turns on/off outlet under sink where dishwasher is plugged into. Keeps tenants from calling advising the dishwasher is not working -- when they have turned off the switch wondering what it does?? ?